When Alex and Kate start chatting on their favourite bands online forum there’s an instant attraction. Their both going to the local gig and of course it’s obvious they should meet in person. The night of the gig is magically for them both, each feeling that the other has the qualities they want from a relationship it develops and soon becomes more than just a crush. However as love blossoms it becomes harder for one of them to keep the secret which has been plaguing them from the start. This secret will ruin everything but things can’t carry on as they are, it will be uncovered no matter what, and Alex can’t think of anything worse than that happening. When push comes to shove will true love prevail, or is it all just an act? I absolutely adore Cat Clarke’s book and she has been a favorite author of mine since her first book, Entangled was in my hands. The reality of her s, the situations they find themselves in and the way she writes is just incredible and so whenever a new book by Cat lands on my doorstep I struggle not to rip it open and start page one straight away. However I always delay it slightly because I’m worried that one day she will deliver a book I don’t like. Its a ridiculous notion and yet again its ridiculousness was proven when I read A Kiss in the Dark because it was just as incredible as all of Cats other books and I loved every second. This review is going to be ridiculously hard to write without spoiling the book so I urge you, if you don’t want to know the secret that Alex is hiding stop reading now. I cannot offer you an honest review without giving away a major plot point that you find out in the first few chapters. It changes the story completely so I cannot do anything but talk about it so please, I urge you to stop reading now if you don’t want to know. The secret Alex is hiding is that she is actually a girl, she isn’t transgender, or intersex or anything like that, its just that Kate assumes she is male from when they were talking online and Alex expects her to figure it out when they meet but she doesn’t and things spiral out of control. Its an incredible story about how awkward and how difficult things can be when people assume certain things and you like them so much that you don’t want to embarrass them by thelling them the truth. I loved the idea and the way it is executed is fantastic, you can totally understand where Alex is coming from. The book is split into two parts, a before Kate knows and an after she finds out, and it is also in split perspective, before from Alex and after from Kate. I have to say I preferred the before, Alex’s voice was in my opinion better and she was a more likable character, I could see her reasoning and it felt like she did it to saveKate from embarrassment as well as herself, she wanted a friend and someone who cared for her and she thought the truth would make her lose that. The ‘after’ from Kates point of view was good and I understood why it made sense to do it from Kate’s pov from a literary angle, however I hated Kate’s naivety and stupidity and I really just didn’t like her as a character. She felt selfish and I couldn’t believe the things she did. She redeems herself in the end but man I really wanted to grab her and shake her. I really did love the story and it wouldn’t have worked if Kate wasn’t as naive as she was and that made me really dsilike her but the story more than made up for it. I couldn’t get over how much it grabbed me and it made me think about the situation Alex finds herself in a lot and how I would react to the events of the book. It really is another incredible book from an already incredible author and I urge anyone who hasn’t read it to do so, even if by this point of my review you will know something as to what happens. 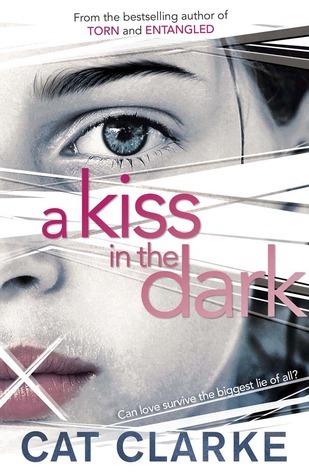 A Kiss in the Dark was published on April 3rd by Quercus books. My copy was sent to me from the publisher in exchange for an honest review. Very hard not to review this book without ‘spoiling’ the secret. Difficult because the reader finds out straight away… I really loved this story though, I thought it was really tense.